As longtime friends and successful real estate agents Denny and Leyla decided to create The Denny & Leyla Team in January 2013. As so often happens, when you add positive people to your life you get much more than expected. 1 + 1 equaled more than 2!!! As a team, Denny and Leyla discovered they had MORE time for their clients, MORE time for their families and MORE time for their communities. 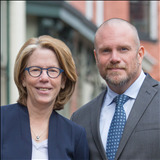 Individually Denny and Leyla have been Top Producers for years and as a team they have been included in The Washingtonian Magazine's Best Real Estate Agents since the list’s inception, been recognized but the Washington Post as 5-Star Professionals, and were among Real Estate Magazine's 100 Most Influential Realtors in Metro DC. They have multiple awards and continually receive 5-Star reviews on Yelp and Zillow, as well as an "A" rating on Angie's List. In their decades of experience, The Denny and Leyla Team have sold nearly $300 Million in volume and are both licensed in DC, MD and VA. When it’s time for you to SELL your home Denny and Leyla will work closely with you to create the best plan for your success. The Team has a database of packers, movers, handymen, plumbers….They will discuss timelines, staging and storage. They will review past and competing sales and how to best position for you to get the most money in the shortest amount of time. They are transparent, forthright, efficient and enthusiastic. And if you are considering buying a home they are equally enthusiastic and thorough. They love their buyers and they love exploring the diversity of neighborhoods and architecture in Washington, DC and the metro area. In their words... "We are true believers in 'Yes I Can' service and in the importance of home ownership! Contact us today for a listing or buying consultation, we look forward to welcoming you to our family of clients."